Want to make your next outing a special one? Whether it's a gathering in Lowell or a reunion in Rockport, book a luxurious Moonlight Limousine event limo, party limousine, town car or SUV and let us take care of the rest. Based in the Newburyport & Salisbury area, we offer service throughout the North Shore and New Hampshire's Seacoast region, including Newburyport, Peabody, Haverhill, Lowell, Boxford, Andover, Portsmouth, Hampton, Seabrook and more! If you're headed to Boston, we can get you to a sporting event (Bruins, Celtics, Red Sox, Patriots), concert, or more. Looking for something to do, check out some of the annual events, festivals, and concerts in the area! Let us provide you with the high-quality, professional service you deserve. We look forward to having the opportunity to be a part of your special day! Looking for a party bus? Moonlight offers the ultimate party limousine, the Stretch Escalade Limos! 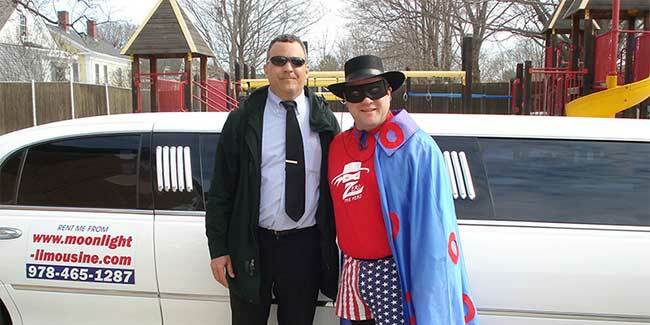 If you have any questions, or if you would like to reserve a party limo for a special occasion, please feel free to call us anytime at 978 465 1287, or click here to book a reservation online. Also, be sure to sign up to be notified about our periodic special promotions by simply entering your name and email in the box below! Bar Hopping - Sick of worrying about who's playing DD? Leave the driving to us and reserve one of our limousines to keep the party rolling in between stops! Birthday - Make any birthday one to remember by booking one of our luxurious stretch limos, a party isn't a party without one of our party limos. Whether it's a sweet 16, 21st birthday, or just because! Concerts - Parking lot hassles are a pain. Travel in style to your next concert and leave the driving to us! Whether you're concert is in Boston or the Hampton Beach Casino Ballroom, we can offer great concert car services for you. Book a concert car service with Moonlight Limousine today! Corporate - We have been providing corporate sedan and limousine services since 1988. Book your Logan Airport transportation with ease! Home, office, hotel or convention center pick-ups/drop-offs available! New Years Eve - The end of the year is always a cause for a celebration...finish it up in a stylish Moonlight limousine! Dinner/Night's Out - Whether it's just you and your date celebrating a special night, or a large group of friends looking to get out of the house for a few hours, a limo adds a touch of class and fun to anywhere you may want to go! Our Stretch Escalade Limos are fun and classy alternative to party buses and hummer limousines. Sporting Events - Reserve a luxury limo of your choice for the big game - Bruins, Celtics, Red Sox or Patriots! Avoid stadium parking or ride to the game in luxury with our sporting event transportation in Boston. We also offer a variety of leisure transportation in New Hampshire: boating, fishing, shopping, and more. Theater - The Boston Theater is spectacular- especially when you have a curb-side ride to get you there! Theater limos from Newburyport to Boston and more.